The volcano that made La Fortuna abruptly quieted in October of 2010. Can the town rebrand itself as a rain forest adventure destination? LA FORTUNA, Alajuela – Over the last four decades, Arenal Volcano’s dramatic explosions and lava flows transformed the surrounding farmland in north-central Costa Rica into one of the country’s hottest tourist destinations. But 16 months ago, the activity subsided, leaving hundreds of hotels and businesses without their premier attraction. “It’s a pity, but the volcano decided to take a break,” says Eliezer Duarte, volcanology research professor with the Volcanological and Seismological Observatory of Costa Rica (Ovsicori). To put Duarte’s statement in perspective, scientists believe that the previous “break” of this kind – no explosions, lava-spewing, or interior activity – lasted more than 500 years. 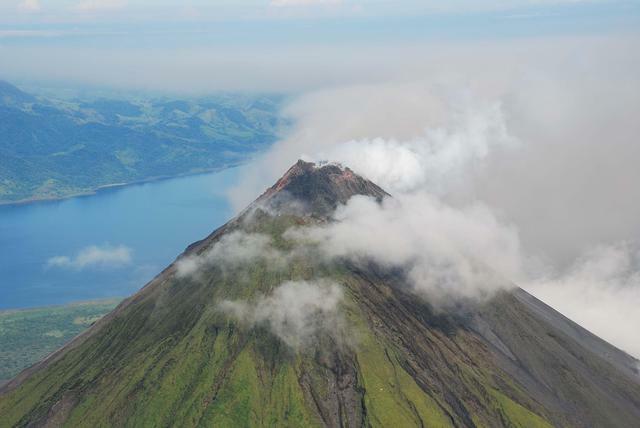 Although the volcano is still considered active and occasionally belches gases, area entrepreneurs in recent months have been coming to terms with the prospect that Arenal may not erupt again in their lifetime. The volcano’s quietude has raised questions about long-term tourism viability in the Northern Zone, but it appears that the industry has quietly, smoothly transitioned into a still-lucrative, post-eruption era. Whether that success has been driven by misleading signage, a plethora of other excursions, or tourist indifference remains to be seen. But this much is clear: Business has gone on as usual. “If the meat is good, the customers will arrive,” says Carlos Peñaranda, owner of El Novillo de Arenal, a steakhouse just outside of La Fortuna. He was speaking of the beef at his restaurant – once a prime eruption viewing spot – but the same can be said for many of the neighboring hotels and tour operators. For now, the tourists are happy with their experience and the businesses keep right on booming – even as the volcano sleeps. Each day on the streets of La Fortuna – a volcano boomtown about a three-hour drive northwest of San José – prominent signage instructs tourists to “See Lava!” Restaurants, shops and tour operators display insignias of exploding volcanoes, and red Christmas lights snake around the wooden columns supporting a bar called the Lava Lounge. Inside, a video of an erupting Arenal plays on repeat. “They’re hiding it,” says tour guide and map designer Álvaro Arce. Seated at one of the tables in Lava Lounge, he’s talking about his town’s reluctance to remove outdated and inaccurate signage and web material. He estimates that 75 to 80 percent of the tourists he encounters expect to see lava, and he believes that eventually this will create problems for the area. That hasn’t happened yet. Some of the area’s most prominent hotels, such as Nayara Hotel, Spa & Gardens, Arenal Observatory Lodge, and Tabacón Grand Spa Thermal Resort, have apparently rebounded since the 2008 financial crisis; managers now say the occupancy rates are hovering around 95 to 97 percent. The Arenal National Park actually saw more visitors in the year after it quit throwing lava than in the previous year, according to park ranger Erick Cuniga. Between 2010 and 2011, the number of park visitors increased from about 70,000 to 74,000, he said. Nearly every person interviewed for this story echoes that enthusiasm, and many point out that their tourist economy was perfectly healthy without the lava. On July 29, 1968, Arenal’s some 500-year slumber ended with a massive eruption that killed 87 people and demolished the villages of Tabacón, Pueblo Nuevo and San Luis. On the next day, another eight people died in a surge of hot gas and rocks now known as a pyroclastic flow. These events were the first indication to nearby residents – who were mostly cattle breeders and cheese producers – that Arenal was not a large hill, but a volcano. Far from an attraction at that time, the devastating volcano left the dusty hills of La Fortuna empty for months before people trickled back in and carried on with their lives. For nearly two decades, they remained uninterested in the business prospects of the lava-spewing giant in their backyard. But as more and more tourists showed up for the volcano’s frequent fireworks displays, ideas began to spark in the minds of weary farmers. Some began constructing cabins on their property, and others transformed their haciendas into hotels and resorts. In the evenings, anybody with a car would transport tourists to lookout areas for the volcanic spectacle and a dip in the toasty Tabacón River. In 1991, a visionary architect harnessed a large stretch of that same river for a luxury bathing experience, and his project became the Tabacón Grand Spa Thermal Resort. After Tabacón’s arrival on the scene, the increasing demand for lodging and activities fueled the development of La Fortuna. Over the last 20 years, dozens of hotels and tour operations, many owned by Ticos, have set up shop. While the volcano has unquestionably brought prosperity to La Fortuna, nobody has any illusions about who – or what – has really been in control. The volcano has run the show, and the show has gone on under certain, mysterious conditions. Even on a cloudless night, there was no telling if the lava would spew, and if it did, there was no telling where. Unpredictable pyroclastic flows and eruptions were constantly changing the shape of the volcano – and the direction of its lava flows – by blasting out walls of the two active craters. This meant that on one night, those at the Arenal Observatory Lodge might witness the fiery spectacle, and the next it might be the cluster of lodgings with balconies and rocking chairs facing south. Sometimes the volcano would go quiet, and guests would need to be entertained in other ways. Those fickle flows influenced enterprising tour industry workers to diversify early and often. Rodríguez has certifications for training as a fireman, accountant, student of volcanology, rescuer of tourists and Chinese foot massager. So after Ovsicori recorded the last magma activity in May 2010, and the final eruption subsided on Oct. 10 of the same year, those diverse skill sets were put to use. Rodríguez started his own spelunking business, and later he created a one-day Nicaraguan safari. Many other skilled and educated tour guides went a similar route, but not all of them. Locals say that 16 months after the volcano activity diminished, rogue guides still lurk in bus stations, trying to sell lava tours to clueless tourists. Visitors flock to extinct volcanoes in Hawaii, Italy and plenty of other places each year, and it seems that if Arenal goes in the dormant direction, people will keep showing up. Of all the tourists The Tico Times interviewed in and around La Fortuna about the current lack of activity, none expressed disappointment at not seeing lava. On a stroll around La Fortuna, a Bulgarian couple, Galina Tzoneva and Lubo Vitkov, say that a friend from New York traveled to Costa Rica first and upon her return informed them that the volcano was no longer spewing. Also, they saw it on the Internet. Over at Arenal Springs Resort and Spa, a U.S. man from Michigan wearing a gold chain and a blue bathing suit says he had beheld Arenal’s piping-hot lava twice in previous years, and he expects to see it again. Upon learning the bad news, he is unconcerned. In 1991, the Esquinas forest in southern Costa Rica, one of the last unprotected lowland tropical rainforests on the Pacific coast of Central America, was declared a national park by presidential decree. However, since all land was in private hands, it could only be catalogued as a “paper park” until it was owned by the Costa Rican national park service. Exploitation permits to use these lush forests had been issued before the declaration of the park and deforestation actually continued, inflicting irreversible damages upon the Esquinas Forest and jeopardizing the objectives of the decree. Later that year, Michael Schnitzler, a well-known classical violinist from Vienna and part-time resident of Costa Rica, founded a non-profit organization called “Regenwald der Österreicher” (“Rainforest of the Austrians”) with the goal of raising funds to buy property in the Esquinas Forest. By 2005, over 15,000 mostly Austrian individuals had donated about EUR 2,000,000, enabling the purchase of about 31 square kilometres of rainforest. The property, most of which had exploitation permits for logging, has been donated to the Costa Rican government and become part of new Piedras Blancas National Park; logging in these areas has ceased. “Rainforest of the Austrians” has also donated funds to the National Park Foundation for the employment of park wardens, and to Zoo Ave and Pro Felis for the reintroduction of scarlet macaws, margays and ocelots into the Esquinas forest. In 1995, Michael Schnitzler received Austrian government’s highest environmental award, the coveted Konrad Lorenz Prize. In 2000, “Rainforest of the Austrians” was honoured with the prestigious, $ 30,000 Binding Environmental Prize in Liechtenstein. Michael Schnitzler is also Honorary Member of the Costa Rican National Park Service. Alongside this purchasing of land “Rainforest of the Austrians” is running the Esquinas Rainforest Lodge, which is an important employer for the people of neighbouring La Gamba village. The third part of the project is the Biological Station La Gamba, which provides the scientific basis for research as well as protection activities. For example, researchers were able to identify more than 180 distinct tree species on a single hectare! This labels the Esquinas Rainforest one of the hot spots of biodiversity. How are donations put to use? After the government of Costa Rica has evaluated the properties and our lawyers have made sure that there are no mortgages or legal problems, we make a sales contract with the owner. Properties with management plans for logging receive priority. The owners receive their payment directly from our organization, and the property is registered in the name of our Costa Rica-based organization “Bosque de los Austríacos”. Later, properties are donated to the Piedras Blancas National Park authority and thereby automatically become part of this National Park. Every square inch of property purchased since 1992 is supported by exact, detailed documentation. A contract with the Ministry of Environment, signed January 31, 1992, guarantees that donations from “Rainforest of the Austrians” may only be used for land purchase in the Esquinas Rainforest. Presently (2004), only six park rangers are employed by the Costa Rican Park Service, two of them are paid by Rainforest of the Austrians. There is a plan to increase this number. Despite the fact that there are so few rangers, the park is relatively well-protected, because it is difficult for illegal loggers or hunters to access the heart of the Esquinas forest. It is no coincidence that, of all wilderness areas in Costa Rica, the Esquinas rainforest has been chosen for the reintroduction of endangered species. Environmental education projects for the local population are being undertaken by the Fundación Neotrópica and are being financed by Austrian Development Aid funds. The goal is to teach the people that a protected and unharmed forest has a far higher value than a logged forest. One of the sustainable development projects in the Esquinas forest is Esquinas Rainforest Lodge, from which all profits are invested into the community projects. How much has been donated and how much is still missing? Altogether, thousands of mainly Austrian citizens, countless schools, as well as companies and sponsors have donated € 3,235.416,56 to Rainforest of the Austrians. Between 1991 and 2009, Rainforest of the Austrians has bought land for € 1,849.411. Less than 20% of all donations have gone into PR, office expenses, printing, postage, banking fees. Together with land bought by the Costa Rican government and two U.S. NGOs, a total of around 70% of the Esquinas rainforest has been purchased. What kind of animals live in the Esquinas rainforest? Around 140 mammal species (including jaguars, ocelots, three kinds of monkeys, coatimundis, anteaters, and sloths), 100 species of reptiles and amphibians (including the rare South Pacific bushmaster, several species of poison-dart frogs, caimans and crocodiles), 350 species of birds, and more than 6000 kinds of insects live in the Esquinas Rainforest. Besides, the underwater world of Golfo Dulce has an immense variety of fish, like colorful reef fish, world-record sailfish and marlin as well as dolphins and even occasional whale sharks. Rainforest of the Austrians supports an exemplary project which is dedicated to freeing confiscated animals which have been held in captivity. The well-known organization “Zoo Ave” has successfully reintroduced hundreds of parrots (including 48 scarlet macaws) into the forest where they once lived before they were hunted or poached to near-extinction. The ultimate success depends on whether the birds will breed and multiply. Since 1948, 26% of Costa Rica’s total land mass have been put under some kind of protection, either as a National Park, a Forest Reserve, or a Private Reserve. No other country has such a high percentage of protected land, and never has a protected area been dissolved. Costa Rica’s National Park system is it’s pride and trademark, and revenues from tourism have even surpassed income from traditional sources like coffee, bananas, or pineapples. The fact that the Republic of Costa Rica itself has purchased 3400 hectares of land in the Esquinas rainforest is the best guarantee that the government does not intend to dissolve the National Park. How can I visit Piedras Blancas National Park? Esquinas Rainforest Lodge is the only entrance to the park which is accessible by road. The trail system departing from the lodge measures 10 miles in length and leads through primary and secondary lowland tropical rainforest. Amadeus travel agency offers tours or packages which include Esquinas Rainforest Lodge on their itinerary. From 1992 until 2005, Rainforest of the Austrians has purchased 3093 hectares (7644 acres) of land in the Esquinas Forest. Together with land purchased by The Nature Conservancy (398 ha/983 ac) the U.S. hydroelectric company Tenaska (2.123 ha/5246 ac) and the government of Costa Rica (3.413 ha/8434 ac), roughly 61% of the whole area have been purchased. Most of the properties have already been donated to the National Park Service of Costa Rica, while a few are still in the process of being registered. Piedras Blancas National Park closes the gap between Golfo Dulce Forest Reserve and Golfito Wildlife Reserve, creating a 800 km² (309 mi²) corridor which stretches all the way around Golfo Dulce and connects with Corcovado National Park.